The piezoelectric ceramic buzzer has a simple structure in which a ceramic piezo-element is glued til a vibration plate. The piezoceramic element expands eller shrinks diametrically when an alternating spænding is applied. 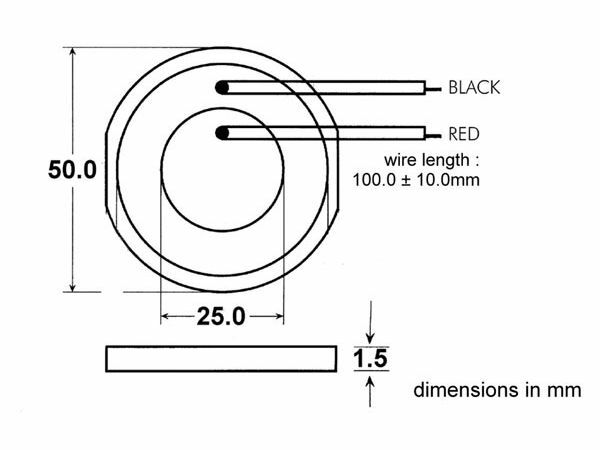 This characteristic is used til bend the vibration plate, which generates sound. 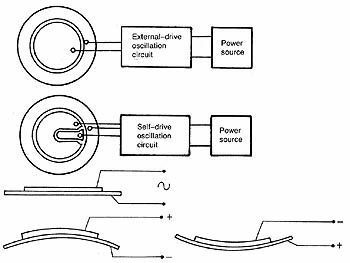 The acoustic generating method can be subdivided roughly into the self-drive oscillation method og the external drive oscillation method. The former yields the lowest impedance on the acoustic generator og produces sound through the oscillator circuit's positive feedback. This allows the creation of sound pressure using a simple circuit. The external drive oscillation method uses a fixed frequency og produces sound through the oscillator.